I think most people hate listening to recordings of themselves. I am no exception. I cringed while watching the news piece this morning. But Ella was great. Her television debut was a success. 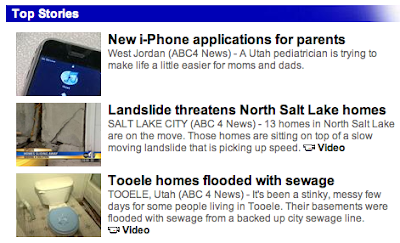 And the story was a "Top Story" on the ABC website this morning. Right up there with natural disasters and raw sewage. Can't beat that. That is so cool Alissa! I was even telling Josh about it. I would totally get it if I had an iPhone. Ok I am so mad...I actual got at 5:40 and watched until 7 to see it...was it on right at 5:30? I hope you Tivo'd it. I really want to see. Anyway, that it so cool! I'm sure you did a great job. You better have saved it so we can watch it when we come to visit! They only give the print story online. Al, you did great- I was SO impressed. And Ella was perfect! Good job- I'm even glad Ty had me up at 5:15 so I didn't miss it! I want to see it too so burn me a copy off of TiVo if you can - wow, I have a famous friend!